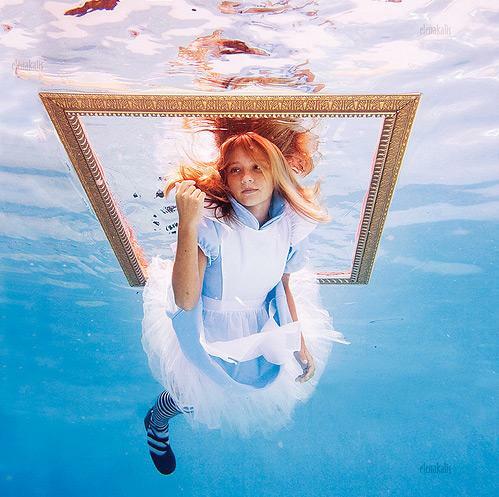 Photographer Elena Kalis has a very unique way of capturing people; as an underwater photographer, her work is very different to anything else. Elena spoke exclusively to Gutter Magazine about breathing new life into a very old story. Underwater photography is an unusual style, where did you initially get the idea from? I live on the small island in The Bahamas, surrounded by clear warm ocean. I spend a lot of time in the water and often with my camera. Things look very different underwater. I like how different things and people look underwater, movements are graceful and free and it has a dreamlike quality that is difficult to achieve on land. Shapes, lights, colors are shifting all the time. Everything is fluid. I became interested in capturing this environment. Why did you choose to recapture “Alice” in your own unique way? “Alice In Wonderland” is my favourite book of all time. It’s limitless and free. It is open to interpretations, and so many people are inspired by it. It occurred to me that the place Alice found herself when she fell in the rabbit hole or when she went on the other side of the mirror has the same quality as being underwater: different perception of reality, weightless, a dreamlike surreal feeling. I took it from there and made my own interpretation of the story. You had your daughter model as “Alice”, has this inspired you to collaborate more in the future? My daughter Sacha was 10, same age as Carroll’s “Alice” when we started playing Wonderland underwater. She is a natural mermaid and could swim before she could walk. It is easy to work together as she understands very well what I want to capture.We often just try new ideas while swimming in the ocean. Are you pleased with the end result? It took about 2 year to capture a collection of images for this project, although I can’t say that it is finished even now. I like the creative process but it always leaves me drained, underwater photography is physically very demanding. It’s difficult to be objective about the result of your own work. What will you be looking to tackle next? I like underwater photography and still explore new concepts and ideas. It is a fascinating and rich subject for me. I also would like to do more videography in future. Glasgow-based photographer, Nuala Swan is building an already stellar reputation for herself due to her extensive work in live music and fashion photography. I spoke exclusively to Nuala about influences, models and Ziggy Stardust . . .
I’ve always had an interest in photography; I can remember my dad showing me how to work a film SLR when I was pretty wee and when I was older I messed about with compact cameras, taking oh-so-interesting photos of buildings! It wasn’t until I bought my first DSLR a couple of years ago that Irealised that this could be my proper passion. Then, I started shooting live music and I was hooked! It depends on the shoo,t really. For a doll themed shoot that I did with Tea At Aunties, it was theclothes themselves that inspired me to build a shoot around them. For another, I might be inspired by a music video, a painting, or other photographs. At the moment I’m loving the work of photographers Mert and Marcus who do a lot of the covers for LOVE Magazine. Your Work As Both A Fashion/Music Photographer, Which Do You Prefer? It’s hard to choose because they are so different! With music photography, I go along, stand in the pit for the first three songs and take as many photos as I can. If you don’t get the shot you want in that time then it’s too bad! With the fashion work I can plan every detail and then guide the model into the exact position I want and continue to shoot until I get it right. Live music photography can be more exciting, and if you get the right band it can be absolutely electrifying! I recently shot Friendly Fires at Rockness having never seen them live before. I had no idea what a performer Ed MacFarlane is, amazing to shoot. That’s what you hope for every time. That excitement can be there on a photoshoot, too though when you come across a model that totally rocks it. You don’t know until they get in front of the camera whether they’re going to do that or not. Do You Have Work That You Are Most Proud Of? For the live music, I’d probably have to go with a photo that I took of Young The Giant in early 2011.They were playing Captain’s Rest in Glasgow which is a pretty tiny venue and I felt that the close ups reflected the intimate atmosphere of the gig. It was the first time that I really felt that I’d nailed a gig photo which is probably why it still means something special to me. I’ve not been taking fashion photos for that long, only about 3 months or so, so there isn’t such a body of work to choose from. One of my favourites was shot as part of a series of photo booth pictures that I did. The model, Kirstin, just kept on giving me great poses; I had so many photos to choose from. Another favourite shot is from my most recent shoot; the model, Macoula, looks like goddess in front of that green wall. Who Would Be Your Ideal Subject For A Photo? If I could reach in to the past, it would be David Bowie in his Ziggy Stardust days. I’d have loved to have shot him at a gig, but he’s an equally amazing portrait subject. Fashion wise it would be a dream to shoot an Alexander McQueen campaign. Maybe one day! There was a huge void in the alternative festival scene with the departure of Whartscape. Thankfully, the annual Transmodern Festival (it’s been around for almost a decade) picked up the banner of awesomeness and waved it around proudly. The three day event is city-wide and there’s too much to list here, so check out THIS link for info. Current Space at 421 N. Howard St., The 14Karat Cabaret, D:[email protected] at 218 W.Saratoga Street, in Tyson Alley between Franklin and Saratoga Streets and at the Baltimore’s Farmers Market & Bazaar at Holliday and Saratoga Streets! Bethany Dinsick, Meg Rorison, Omar MrOz, Melissa Webb, Sam Shea, Graham Coreil-Allen, Eric F. Avery, The Dandy Vagabonds, Lurch and Holler, Ginny Duncan, Naomi Davidoff, Ada Pinkston and John Flowers. All the ticket info is HERE. Trust me. It’s like nothing you’ve seen before. Do it…. Photos by the lonely villein. Has Banksy returned just in time for the LDN Olympics and the Queen’s Silver Jubilee?! Banning together under the umbrella of May Day (the world’s Labor Day), members of Baltimore’s Occupy Movement and dozens of community groups, organizers, labor leaders and supporters organized marches yesterday that culminated with a demonstration of solidarity at McEldry Square at the city’s Inner Harbor.